Kyle Hutchins was only 22 when he died but the outgoing young man had already inspired all who knew him– starting from the time he was a small child and continuing on even beyond his death. When it was clear that the former Virginia Tech student wouldn’t recover from respiratory failure, his parents knew that donation would be the right thing to do. “It kind of went along with all of his feelings about helping other people and being a compassionate person,” Tom said. Kyle came from Chesapeake and was a natural academic. He made good grades with almost no effort and rarely had to study – “everything came easy to him,” Tom said. 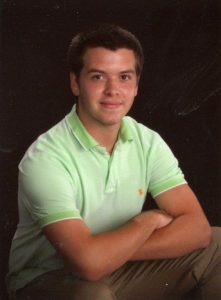 Kyle also loved sports and played everything, from soccer and basketball to lacrosse. He even tried wrestling for a few years. Kyle Hutchins loved to play all sports, from basketball to lacrosse. His brother Ryan was almost five years older and had taught Kyle to play sports. Athletics weren’t always easy though. Kyle had been diagnosed with asthma at age 2 and while he tried not to let it slow him down, he was hospitalized more than once. Especially in the spring, he was “a coughing mess,” Tom said. Tom was the assistant principal at Kyle’s elementary school so the two commuted together in the mornings, usually arguing about what music to play on the car radio. In sixth grade, he switched to Norfolk Academy, a small college prep school about 20 miles from their home. “They were goofy kids but they really loved and admired each other,” Kyle’s father said. After graduation, Kyle attended Virginia Tech, where he was studying accounting. 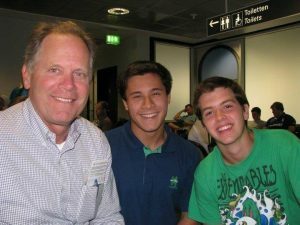 Kyle Hutchins and Alex Fitzwilliam pose with their German teacher at Norfolk Academy, Chris Nelson, in Germany. That awareness had been a recurring theme for Kyle and it played into his need to help others. When he was 3, his mother Melissa started a Thanksgiving food drive to help stock their church food pantry ahead of the holidays. By the time he was 5, Kyle was allowed to help and it was something he always took seriously. “Doing something in the community that is pure volunteer work for the benefit of other people in need makes me feel extremely good about myself,” he wrote in a high school assignment. Kyle also enjoyed – actually enjoyed – doing yard work for neighbors who couldn’t do their own. He also loved helping to feed homeless people in his community. He understood that “many people are in their current situation due to circumstances they may not have any control over” and it was important to him to help out in any way he could. “The main goal in life is to help others and to be polite and respectable while being a ‘good guy,’” he wrote. 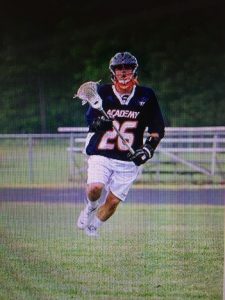 So in that spirit of helping others, Kyle’s parents decided to start a scholarship fund in his name at Norfolk Academy. And because they thought it was something they felt Kyle would have wanted, the Hutchins also made the decision to donate his organs. “It was really part of the healing process and part of the grieving process,” Tom said. One of the Kyle’s kidney recipients, Shayla, lives in Chesapeake as well and the Hutchins family sees her on a regular basis. “She’s a wonderful young lady and we’re so happy that she’s gotten better,” Tom said. Tom and Melissa have received letters from three others – a man in the western part of Virginia has exchanged several letters with the Hutchins family, sharing how his life changed after his liver began failing and then how it improved after the liver transplant. 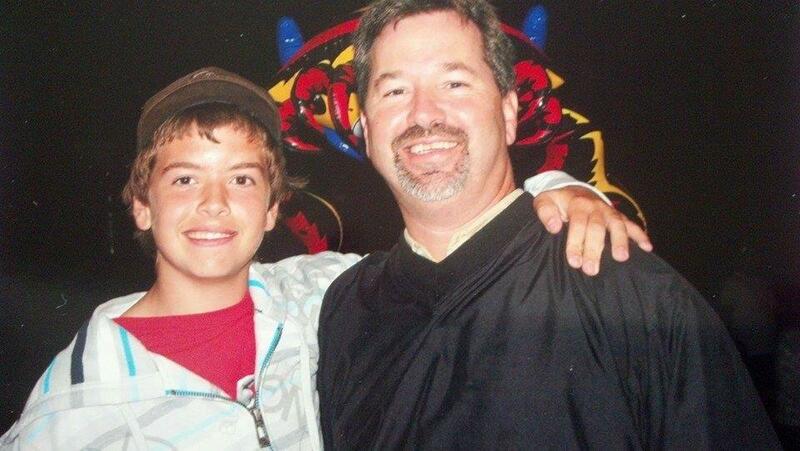 A teenage boy also wrote to say he’d received Kyle’s other kidney and he was grateful for the donation. And Kyle’s heart went to a man who said that because of the transplant, he was doing well enough to travel to Florida to see his daughter get married. The Hutchins are still hoping to meet him. “I know my wife would love to hear Kyle’s heartbeat,” Tom said. For the family, grieving and healing isn’t just about Kyle’s recipients – it’s also about raising awareness so others sign up to be donors as well. For the last two years, the family has been active the donation community and on April 12, NASCAR driver Joey Gase will honor their son at the Richmond Raceway during the Xfinity Series race. 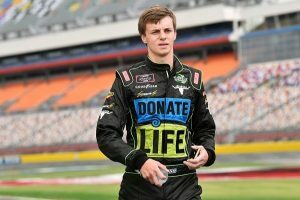 NASCAR driver and organ donation advocate Joey Gase will race in Kyle’s honor at Richmond Raceway in April. Gase was only 18 when he gave consent on behalf of his mother when she died. Since then, he’s been a national transplant advocate, honoring donors by displaying a donor’s name and picture on his car at each race. The race coincides with National Donate Life month and falls only a few days after the anniversary of Kyle’s death. “We’ll dip our hands in paint and put it on his car and maybe write a message,” Tom said. Two years after their son’s death, the Hutchins still struggle but they’ve got help from Kyle’s friends. And as Kyle often reminded his friends and family, touching other people is what matters most. “None of the material things in life really matter after you are dead and gone,” he wrote. Donations in Kyle’s name can be made to Norfolk Academy, 1585 Wesleyan Drive, Norfolk, VA 23502. Write “Kyle Hutchins Scholarship” in the memo line. Organ, eye and tissue donation saves and heals countless lives. Register to become a donor today.